Johann Carl Gottlieb Rönisch was born on November 28th, 1814 into a poor family in Goldberg Silesia. At the age of 10, he began work as an apprentice in a machine shop and learned the trades of mechanic, joiner and turner. Between the age of 16 and 20 he learnt how to build pianos with the well-known piano maker Hänel in the City of Naumburg, which is close to Leipzig. In late 1834, Carl Rönisch gained further experience and knowledge as a mechanic in a spinning machines factory in Goldberg and in Vienna Austria. Then, in 1843, at the age of 29, Carl Rönisch returned to the piano industry and was employed as a maker of piano instruments in Löbau Saxony. From there, he moved to Dresden, the capital of Saxony and became foreman in the “Rosenkranz” piano factory. Early in 1845, Carl Rönisch started building pianos in his own workshop, and thus the great Rönisch Piano was born. The company’s philosophy: fine tone quality by rock solid, durable construction. Carl Rönisch produced the first baby grand piano in Saxony in 1857 and after having delivered three grand pianos to the court of the King of Saxony, he was named Official Purveyor to the Court in 1859. After two moves to larger workshops, a small factory was established in 1862. The company had meanwhile grown to 60 workers. The fame of the Rönisch brand had spread beyond the regional borders, and due to the growing demand new business contacts were established. The main markets at that time were Russia, Sweden, England, Spain and Portugal. In 1866, he had the epoch-making idea of using a full cast-iron plate in the piano. This frame had five struts and fully covered the pin-block, which allowed for the first time a high tension scale. This revolutionary invention was soon adopted by virtually every piano maker and remains in universal use today providing power, projection, sustain and sonority in the modern piano. The building of a larger factory was required by continuously growing demand for Rönisch pianos. In 1873, the production started at the new factory in Dresden-Neustadt. Carl Rönisch was one of the first German manufacturers to export overseas. Rönisch instruments were held in high esteem in Southern Africa, California, Mexico, Australia, the East Indies, and in all of the English colonies. The long and successful Australian history of Rönisch began in 1879 as Rönisch exhibited two pianos at the Australian International Exhibition in Sydney. One year later Rönisch was represented again by its fine instruments at the Melbourne International Exhibition in 1880 – 1881. Rönisch won gold medals in the world exhibitions in Sydney 1979 and Amsterdam 1883. In 1888 – 1889, the now well-established Rönisch Company attended the Centennial International Exhibition in Melbourne and displayed one grand piano and two upright pianos on the stand of his agent Nicholson & Co., who then held the sole agency for the Australian mainland colonies, Tasmania, and New Zealand. Rönisch was awarded the first prize for its extraordinary grand. Today, this Rönisch Concert Grand with the serial number 8461 can be admired at the Australian National University of Canberra (ANU). As part of Australia’s musical history it is the centerpiece of the Keyboard Institute’s collection at the School of Music. In 1884, Carl Rönisch was appointed Royal Councillor of Commerce; this was followed by the appointment as Royal Purveyor to the Court of Sweden and Norway in 1890. 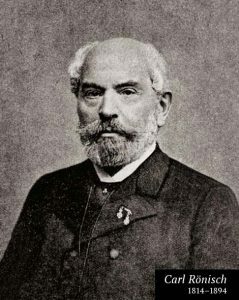 Carl Rönisch died in 1894 at the age of 80. At that time, his factory was producing 1500 instruments per year and employed 250 people. The management of the company was taken over by his sons Albert as the business manager and Hermann as the production manager. Rönisch won gold medals again in the world exhibition in Chicago 1893 and in Paris 1900. In 1898, Carl Rönisch’s sons established a branch in St Petersburg Russia with an annual production of 1000 instruments. At the turn of the century, Rönisch had become a leading brand known the world over. Famous artists including Hans von Bülow, Richard Strauss, Edward Grieg, Giacomo Puccini, Anton Rubinstein, Sergei Rachmaninov and many others played Rönisch grands and uprights. In 1901, the Rönisch Company was named Imperial Purveyor to the Emperor of Austria and Hungary. One year later in 1902, a cooperative agreement with Ludwig Hupfeld began. Rönisch supplied grand and upright pianos while Hupfeld installed the pneumatic instrument (Pianola). A close relation between Rönisch and Sergei Rachmaninov continued as he spent three winters in Dresden with his family from 1906-1908. His Rönisch grand with the serial number 59183 is displayed today at the Rachmaninov Museum in Iwanovka Russia, the former country estate of the family. Among other works, Sergei Rachmaninov composed his world-famous 3rd Piano Concerto on this Rönisch grand in 1909. The export to Australia grew due to the great demand for Rönisch and new agencies had to be established. Rönisch was represented by Nicholson & Co. in Perth; Paling in Sydney and Carnegie & Sons in Melbourne. World War I was a tragic time for the Rönisch Company and family. Albert died in 1917, Hermann lost his only son. The factory in St.Petersburg was lost due to the Russian Revolution. In 1918, Hermann Rönisch sold the company to the Ludwig Hupfeld AG company although he remained the manager of the Rönisch factory in Dresden. He died in 1925. Before the Second World War, the great depression with its economic crisis almost brought the end to the production of pianos. Exports to Australia of the German piano manufacturers dropped down to 25 upright pianos and 39 grand pianos, which was caused by the economic crisis and by an import duty of 55%. However, Rönisch found the solution to keep the Australian business alive. Since 1936, Carnegie’s Pty. Ltd. in Melbourne was the sole agent for Rönisch in Australia. In 1938, Rönisch licensed Carnegie to manufacture Rönisch pianos in Australia. The production started in the same year in Carnegie’s own piano factory of Francis Howard in Richmond, corner of Vere St and Belgium St. The pianos were labeled on the iron frame with…“Registered Australian Trade Mark No. 14169. Made in Australia under Special Licence”. 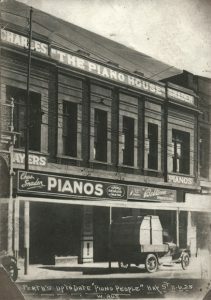 The pianos were distributed to Brisbane, Sydney and Melbourne for their own Carnegie stores. In addition, Rönisch was sold through Carnegie to Elvy & Co. Ltd. in Sydney and W.H.Glen & Co. in Melbourne. In South Australia Rönisch was delivered to the Allans Adelaide store, and in Western Australia to Nicholson’s Ltd. in Perth. The agency of Carnegie with the Rönisch piano production in Australia was held over the WWII until 1949. On 13th February 1945 the Rönisch factory in Dresden was destroyed during bombing raids and was not rebuilt. The original factory of Ludwig Hupfeld in a suburb of Leipzig, which survived the war almost unscathed, became the new home for Rönisch pianos. On 5th June 1945, the company started again from scratch with 50 workers who had to produce containers for marmalade, pasteboard suitcases and handcarts, under the direction of the Allied Military Command. The dismantling of the factory started as part of the reparation payments to the Soviet Union. In 1946, the “Leipziger Pianofortefabrik” was established. Regardless of the name, piano production was unimportant; furniture was the main item. Finally in 1948, the piano production was re-started with 13 instruments and the first Rönisch piano after the war was exhibited at the Leipzig Trade Fair with living room furniture. In October 1949, the first export after the war was achieved; five pianos were sent to Mexico. In 1952, the first 10 grand pianos were produced. Two years later, in 1954, the total production reached the level of 720 pianos per year but the main product line was still furniture for schools, living rooms and bedrooms. Pencils and sports gear also were manufactured. It was not until 1960 that the company concentrated again on its core business of piano building and then reached an annual production of 2000 pianos. Exports to Australia resumed in October 1951 with the shipment of 5 Rönisch upright pianos to Carnegie’s Pty. Ltd. in Melbourne. However, the post-war decade was characterised by the rapidly declining market for pianos. Thus, the piano factory of Francis Howard was closed in 1954 and in 1955 Carnegie’s left the piano business. The Australian Rönisch agency was granted to Caminer Bros in Darlinghurst (Sydney) NSW. In October 1957, this company started with the importation of 2 Rönisch upright pianos and 19 Mannborg harmoniums. In the 1960s and early 1970s Caminer Bros. acted as general agent for Australia and managed deliveries to Suttons in Sydney, Snadens Pianos in Perth, Winkworth in Stanmore, Brash in Melbourne, King & King in Brisbane, Elvy in Sydney, Music Houses in Sydney, L.S.Wise in Adelaide, Australian Musical Industries in Melbourne and Nicholson & Co. in Perth. In 1964, the industrial production started with the installation of an assembly line for 220 pianos leading to a volume of 4170 upright pianos and 144 grand pianos. Due to the growing demand especially in export, an increase of the production capacities was required. In 1967, the “VEB Deutsche Piano-Union Leipzig” was established with the merging of two piano factories and the amalgamation of two companies which produced keyboards and actions. In the 1970s the Australian distribution network was enlarged and more dealers imported and sold Rönisch. These included Logan Pianos, Clef Music, Allans, Pierce Music, Beale, Premier Pianos, Hayward, and Lechstein. Because of the huge increase in Rönisch sales in both Australia and New Zealand, the Corona Indent Company of Sydney was entrusted with the organization and coordination of Rönisch Piano deliveries. Corona, which was operated by Lisa Gerber and her family, maintained this Rönisch association until just after the German Reunification in 1990. In 1978, the Rönisch factory (plant 1) reached a volume of 7810 pianos by concentrating on upright pianos and the production of grand pianos was moved to a new site (plant 5). In the 1980s the business in Australia was focused on two companies, Brash (which later merged with Allans) in Melbourne and Zenith Music in Perth. The deliveries to Brash reached the high level of 177 pianos in 1989. Zenith Music too achieved great success with Rönisch. In the mid 1980s the “VEB Deutsche Piano-Union Leipzig” achieved its greatest expansion and produced 21 000 upright pianos, 1300 grand pianos as well as 350 harpsichords and spinets. It was a combination of 7 piano factories and 6 factories for the supply of actions, keyboards, soundboards, cabinets, metal parts, and iron frames. 3300 people were employed and the “VEB Deutsche Piano-Union Leipzig” with its 13 plants became the largest manufacturer of pianos in Europe. In 1986, the annual production of the Rönisch factory reached 8600 upright pianos which were produced by 240 workers. 90% of the production was exported worldwide. As a consequence of the German Reunification in 1990, the former state-owned combine “VEB Deutsche Piano-Union Leipzig” was dissolved. The Rönisch factory as parent location and headquarters was re-named “Leipziger Pianofortefabrik GmbH” again, and had a slow and difficult time under the very different conditions of the free enterprise system, but it succeeded. After decades of mass-production, Rönisch turned back to its origins by emphasizing creativity, quality and the extra care one still expects from a quality German made piano. In 1992, the reorganization of the production process and the re-designing of the product range were completed. An unparalleled marketing campaign secured stable market shares in both the domestic and international markets. Instruments made by Rönisch have again become a quality and respected brand and this is recognized in all countries of Western and Southern Europe as well as Scandinavia. Next, the company expanded its sales into the Far East. In some countries, it became the leading German piano producers. Almost 70% of the production was exported. In 1994, cooperation agreements with some up-market brands were entered into with the Rönisch Company building semi-finished and complete pianos for Sauter, Feurich, Thürmer, and Pfeiffer. The celebration of 150 years since the foundation of Rönisch took place in 1995. On the occasion of this important anniversary the production of grand pianos recommenced. In 1997, after years of successful cooperation, the company “Carl A. Pfeiffer” from Stuttgart took over Rönisch and the “Pianofortefabrik Leipzig GmbH & Co. KG” was established. In 1999, the product range widened with 4 types of upright pianos and 2 styles of grand pianos being offered in 103 variations. A second export drive re-opened markets in Australia, New Zealand and the USA. 9 years after the German Unification the export of Rönisch pianos to Australia was resumed. Allans ordered their first container shipment in 1999. Zenith Music followed with their first container shipment of Rönisch pianos in 2001. Both the Allans Group (Queensland ,New South Wales, Victoria, South Australia) and Zenith Music (Western Australia) became Rönisch sole agents. In 2008 Rönisch, as with all piano manufacturers, was affected by the economic downturn during the global financial crisis. One year later, Rönisch separated from its parent firm “Carl A. Pfeiffer” and the long-planned merger with the world-famous “Julius Blüthner Pianofortefabrik GmbH”, the other quality piano manufacturer in Leipzig, took place. In October 2009, the “Carl Rönisch Pianofortemanufaktur GmbH” was established and moved to the Blüthner factory in Großpösna nearby Leipzig. The production processes were re-organized, manufacturing facilities re-designed, and the organizational structure enhanced. Both Blüthner and Rönisch now produce quality German made pianos under the same roof. In 2010, Rönisch re-designed and upgraded the product range which comprises 3 types of upright pianos and 3 types of grand pianos in 118 cabinet style and colour variations. The focus on the traditional Rönisch markets in the Pacific Area brought stable growth. In 2011, the total export sales of the company amounted to 62% again. In 2013, Zenith Music celebrated the 30th anniversary of purchasing Rönisch pianos as sole agent for Western Australia and 2013 coincidentally also marked the 30 years of a close relationship between the Cranfield family, owners of Zenith Music & Snadens Pianos, and Frank Kattein, the General Manager of the Rönisch company. In recognition of this successful story, Rönisch came out with the “Carl Rönisch Edition”. These Rönisch pianos are a very limited special series, which are modeled on the pianos that had established the fame and reputation of Rönisch in Australia in the 19th century. The year 2015 marks a further milestone in the rich and successful history of Rönisch with celebrations for the 170th anniversary of its establishment in Dresden and its remarkable presence of over 140 years in Australia. The “Carl Rönisch Pianofortemanufaktur GmbH” continues the tradition of the famous name, Rönisch. By maintaining quality and an innovative approach the legacy of Carl Rönisch is fulfilled. Carl Rönisch would be very proud of his successors who are maintaining the German tradition of piano making in the production of quality German made pianos in the twenty first century.